In Part One I asked the question, "Can I somehow use hardwood ash as a substitute for baking soda?" We looked at the history of baking soda, including it's early precursors made from hardwood ashes. The earliest recipes refer to the somewhat refined products of potash and pearlash. But how would that equate to sifted hardwood ash? Unknown. The chemical composition of hardwood ash is highly variable, depending on tree type and burning temperature. Still, for a little kitchen chemistry experiment, I figured I'd just have a go and see what I got. To test my ashes, I made ash water by stirring the ashes into one-quarter cup of filtered water and letting it sit overnight. Making ash water with hardwood ashes collected from the wood stove. I made three solutions: one with one tablespoon of wood ash, one with two, and the last with three tablespoons. These were stirred into 1/4 cup filtered tap water. The insoluble components sank to the bottom and the next day I poured off the clear water containing the soluble components that I wanted. My first step was to test each of these with litmus paper. Left to right: 1 tbsp, 2 tbsp, and 3 tbsp. This kind of pH testing is approximate but still helpful. As you can see in the caption, I found the solutions to be progressively more alkaline. The next step was to see how each of these would react with an acid - in this case white vinegar. I started with a "control" of 1 tablespoon baking soda in 1/4 cup vinegar. My control - reaction was immediate. For my test subjects I used one-quarter cup vinegar and 1 tablespoon of ash water. Here are my results. Solution #1 (with 1 tbsp wood ash) - no reaction. Solution #2 (with 2 tbsp wood ash) - no reaction. Solution #3 (with 3 tbsp wood ash) - no reaction. Surprised, I dumped the remains of solution #3 into the vinegar and, again, no reaction. I had been expecting at least some reaction so I was puzzled. I did one more vinegar experiment, this time adding 1 tablespoon dry hardwood ash. Solution #4 - wood ash in white vinegar - reaction. The reaction was not as vigorous as the control, but it was a fair one nonetheless. The murky color, however, doesn't seem to recommend straight wood ash for baking, does it? Still, it got me pondering. "Passing water through wood ashes extracts both potassium carbonate and potassium hydroxide (and other potassium salts, and the sodium salts, too, but there's fewer of those). I don't think most articles consider that there is a significant amount of potassium hydroxide, but that's what reacts with carbon dioxide to make potassium bicarbonate. Potassium carbonate wouldn't react with carbon dioxide; it's already "fully carbonated." :-)"
Potassium carbonate is pearlash, which I mentioned in Part 1. The lack of reaction would explain why the historical recipes I've seen do not call for an accompanying acid. The reaction must therefore be heat activated. So my preliminary experiments did not turn out as I expected, and left me wondering about those references to ash water I told you about in Part 1. What's next? This post is probably long enough, so I'll answer that in Part 3. Click here to continue. 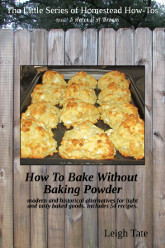 Now available: How To Bake Without Baking Powder: modern and historical alternatives for light and tasty baked goods. Includes 54 non-baking powder recipes. Click here for more information and where to buy. and this is why people love reading your blog...you ARE a chemist in the word's literal meaning...and i will keep checking back until you figure this out. thanks for all of your experiments Leigh! we appreciate them! Wowser. Great experiment. So much old knowledge lost, it can't be recovered on re-discovered. You go gal. I'm on the edge of my seat ... can't wait for Part III! They used to use salt to make salt risin bread, basically it is fermenting a potato or something and using the bacteria like yeast. Probably nicer than wood ash. Interesting hypothesis all round. Heat would be the next logical conclusion. Though I can't help wonder if its something in a recipes ingredients which makes it react more. Given that baking soda is dry, it's more condensed. Adding it to vinegar therefore, creates an immediate reaction. Yet you were adding liquid ash water to liquid vinegar. Perhaps it needs density to create lift, like the baking soda - only the density is the dry ingredients? here's something i read long years ago. split orncobs in half and dry in oven. scrape out the dried cores and use for baking powder. cannot remember if anything was to be added to the ash. it isn't burned, just dried, if memory serves. Did you think about using the wood ash as a soak rather than mixing it in with the water? Putting in a tea holder or cheese cloth bag and letting it soak in? With the right micron size filter you could maybe just let the elements in that you are wanting. Then again I took Astronomy in college. I can tell ya all about a Parallax flux measurement or the relative heat of a star from it's color and that's about it. Oh I love seeing chemistry applied in practice! As a chemical engineer I feel I should step in here and make sure we have the basics right. Although maybe I should wait for part 3 to see what happens next, this is a nail-biter! Baking soda, sodium bicarbonate reacts with acid to produce salt + water + CO2. A base (such as potassium hydroxide) with acid will produce a salt + water. No heat activation required to produce CO2. I not sure about that paragraph you quoted, as the reaction is not "with" CO2, but it PRODUCES CO2, if that makes sense. I am wondering if you only see the bubbles when the carbonate is in solid form, as you had bubbles with baking soda and with the ash, but not the liquid. You definitely extracted something from the ash, as you had a high pH, but do you need to soak more ash to get enough carbonate? My other interest in wood ash is using the liquid to make lye for soap. I found an old book that described dripping rainwater through wood ash. That is a project for winter when I have some ash to play with. Oh one more suggestion, you can try mixing the acid and ash water in a small jar (ideally a test tube!) and quickly put a small balloon over, it inflates you have produced a gas, hopefully CO2! I enjoy seeing that you are trying to use what you have and test it out in the kitchen. I would like to use the wood ash in soap making. I had forgotten all about salt risin bread. Thanks for mentioning that! It will be something else to experiment with and include in my "Baking Without Baking Soda" eBook. Yes, if the soil is alkaline it will fizz. It's all a pH reaction, although I don't completely understand it all. The real test will be in the baking. I know that baking soda reacts to heat, but it works better with thin things like cookies and crackers. For cakes and muffins an acid is needed as well. I know that in double-acting baking powder, the sodium aluminum sulfate reacts with heat, and is why double acting powder allows for a little leeway as to when it goes into the oven. So far tidbits like that are just scattered bits of information in my brain. Haven't got it all figured out yet. I'm hoping the baking experiments will help! You mean soaking it in the water? Anything goes! Experimenting is half the fun. I first read about hartshorn from King Arthur Flour https://www.kingarthurflour.com/tips/quick-bread-primer.html. Also, here is a cool link about salt risin bread. Thanks for that Liz. I have a few more puzzle pieces for part 3, even though I still can't put the puzzle together. :) I would think that any base should react with the vinegar to get at least some CO2. (But again, I'm no chemistry whiz). Homemade lye for soap is also on my list of to-learns. I'll look forward to your experiments too! Good idea. I wonder that if the carbonate can react with water, that I may have lost the CO2 early on. That's another excellent use of wood ash. And also on my list! Thanks for the link about the salt risin bread, too. I'm going to have to dig out my recipes for it and add it to "How To Bake Without Baking Powder." Part 3? You're killin' me here, Leigh:) I agree with Renee's comment~ that's the good ol' way of making lye soap. Lye in water raises the temp. and essentially 'cooks' it as it reacts. Heat might be a fun thing to try. Do you have a fire extinguisher - just in case? I love chem. I should clarify...what I was saying in the paragraph above was in reference to the part in the first post that said CO2 reacts with the pearl ash to make potassium bicarbonate. The actual reaction sequence is probably more complicated, but that's the overall result. During baking, the KHCO3 reacts with an acid to make CO2, as Farmer Liz says, but can also give off CO2 by heating. On the other hand, there must be some of the carbonate in the ashes because it bubbled when you added vinegar. You might be able to get more of it out by making your ash water with hot water. I'm on the edge of my seat to see what happens in part 3; this series has really got the ol' gears turning! Thanks for doing these posts! Deborah, thank you for that! I've been trying to think how to do this - how to burn a corn cob and collect the pure ash. I haven't shelled this year's corn harvest yet, but I usually get a few red cobs every year. Once that happens, I plan to experiment. Sorry! LOL. I planned to go right on to the baking experiments, but these non-reaction results surprised me and triggered more research. Thank you for the more detailed explanation. It definitely helps and I'm getting a better idea of why potash rather than wood ash was used (more than just aesthetics) and later pearlash. Liz emailed and gave me the same suggestion about the hot water, so I'll try that next. It was all so innocent in the beginning and I'm amazed at how complicated it really is. I think I need to get on to the baking experiments, because that was the point in the first place, although I'm learning a lot of valuable stuff in the process! I should mention that there is a soap-like reaction that occurs in baking with these old alkalis, and accounts for a bitter or soapy taste that occurs sometimes. That's apparently why folks preferred the improvement of saleratus and baking soda! Very exciting! I am looking forward to the sequel!